If you are looking for PHP Ajax Jquery Shopping Cart with Bootstrap, So in this post we have discuss how make Multi Tab Shopping Cart By using PHP with Ajax Jquery. In previous one of my post on shopping cart we have make simple shopping by using session and second in second post we have develop shopping cart by drag and drop event but in this tutorial we will build multi tab shopping cart by using php script with mysql database and in this video we will use ajax method with jquery so we will add product into cart without page refresh event. For making multi tab we will use Bootstrap framework for this. 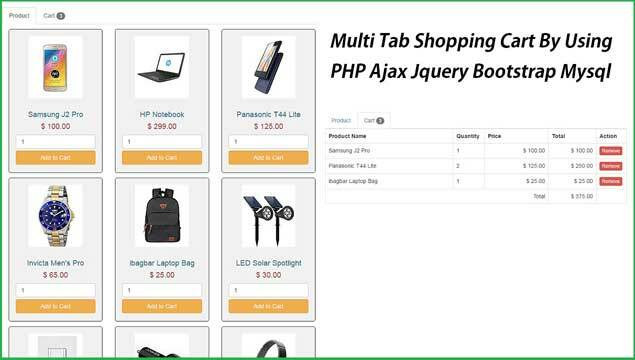 This way we will developed shopping cart with multi tab by using Bootstrap with Ajax Jquery php and mysql, in one tab we will add product into cart and in second tab we will display order table with product. In this shopping cart we have first make tab for display list of product in one tab and shopping cart details in second tab. For making tab we have use bootstrap framework. After making tab we have load product details from database under product. With product we have also add on add to cart button, for add product into cart we have use jquery with ajax method, by using ajax request we can add product into cart without page refresh and product has been added into cart. For check shopping cart we have click on cart tab and under this tab we can see product details which we have added into cart in table format. We can also remove product from cart also, for removing product from cart also we have use jquery with ajax method, so we can remove product from cart without refresh. In this shopping cart we have create one session variable and we have store all details in that session variable, so we have store all product data on web page when we have put order then after that data will added into the cart. hello I liked the tutorial. But how do I send the order data to the db table order_details? Why is it that he only does the Insert Into of Order, Prro not of order_details? Thanks, I hope you can help! Bonjour, c'est excellent il manque le fichier de la base de donnée, et l'article sur récapitulatif de la commande, est ce que vous pouvez m'aider ? Hello, I used the code it works very well, can you help me continue and place the order, and provide me the code listed administrator, please. Thank you very much.